Language is a means of interaction between and among people. Here, language has function as tool which connects them with surrounding. In the community, people realize that without language they cannot interact to each other. Language can become a bridge that connect one another, even connect one another that live in different places. By using a language someone can gain information, knowledge, moreover expressing feeling, and emotions. Nowadays, many people learn the international languages. One of the international languages is English (Larsen 2003: 2). There are four main skills in English: those are reading, listening, writing, and speaking. Reading and listening are called as receptive skill. While writing and speaking are called productive skills. Writing which belongs to productive skill means that writing is process in which the writer produces something that the content is about writer’s thoughts, feelings, and or ideas. Language is a primary tool in communication among human being in a community. English is one of a compulsory subject in Indonesia. One of the aims of teaching English is developing the ability to communicate. The ability involves the four skills: listening, speaking, reading and writing. 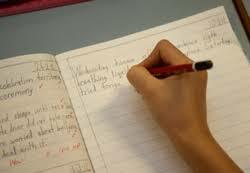 The writer is mainly focused on writing skill, writing is a visual representation of spoken language. Whatever specific form of writing a writer is engaged in, they will have to be able to transcribe language according to the conventions of a particular writing system, and be able to decode visual symbols into their corresponding meanings (Torrance, Waes & Galbrait 2007). Writing is a very complex activity for its complicated components such as the development of ideas, syntax, grammar, organization, vocabulary, content, communication skills, use of punctuation (Erikson 2015: 247). However, writing is not only a matter of putting ideas in a written form but also organizing words and grammar structure and selecting the appropriate diction in order to make the ?????? Belum ada tanggapan untuk "IMPROVING THE STUDENTS WRITING SKILL THROUGH WAKIE APPLICATION (Pre Experimental)"